Brand new mobility scooters can cost any where from several hundred to several thousand dollars. Smart consumers are looking for used mobility scooters in good conditions to save money. When looking for used items, craigslist, ebay, and other classifieds sites naturally come to people’s mind. Search craigslist in every city, you’s find plenty of used mobility scooters for sale on craigslist. 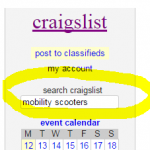 Simply type in “mobility scooters” in the search box, and you will be taken to used mobility scooter listings in your city. 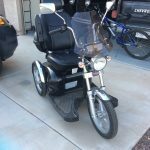 The mobility scooter section on our site also has a wide selection of used mobility scooters for sale by owner listings. 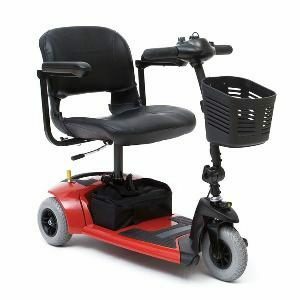 You’ll be able to find popular brands such as Pride Mobility Scooters, Golden Mobilty Scooters at bargain prices from private owners. For example, this Pride Mobility Scooter 3 wheel motorcycle type scooter was selling for half of the purchase price. And this Golden LiteRider Scooter was selling for less than half of the purchase price.